If you are looking for information on the HART Health franchise business opportunity, HART Health franchises or HART Health franchising, then you have come to the right place. Since 1976, we have been a leading manufacturer and distributor of industrial first aid kits and immediate care medical supplies for businesses with 50 employees or more. We offer our customers exceptional quality, onsite service, and at highly competitive prices. Work from home. No landlords or leases. No bosses looking over your shoulder. Low start up costs, low risk. Recession-resilient. 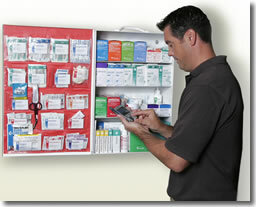 All businesses must stock first aid supplies by law. Easy to find new customers. Ramps up quickly. Easy to keep customers you already have. Easy to grow. Low accounts receivable. Low bad debt. No employees to start. No management hassles. No payroll. Start right away. Open for business in 90 days or less. "Monday through Friday" business. Few weekends or evenings. Enjoy work/life balance. Getting New Customers - Setting up appointments with decision makers to discuss why they should switch to HART Health. Current clients include: Pepsi, Holland America Cruise Lines, Comcast, Costco, and Bill & Melinda Gates Foundation. Professional clients. Not working with general public. High quality, competitively priced products. How do HART Health franchisees spend their day? Calling on new customers and servicing existing customers. Can I own multiple territories? Our target franchisee will ultimately want to own two or more territories. Monday through Friday from 8-5. You may work an occasional evening or weekend. How has the economy impacted HART Health? The economy has not had any major negative impact on our business because businesses must stock first aid supplies by law. Once you and the HART Health leadership team decide they want to do business together, a franchise can be operating within 60 days. Self-starter. Performs well with little supervision. Highly trainable. Likes new challenges. Ability to follow a proven sales system without feeling the need to deviate from the plan or change the system. Desires to start a business within 180 days. Track record of past success.